Exersaucers are an updated design to the older, unsafe baby walkers. You may not know that baby walkers have actually been banned in Canada completely due to safety issues. There are even fines of up to $100,000 for selling them! Baby saucers, sometimes called jumpers, are perfect if you need to go “Hands-Free” for a short while or take care of quick chores around the house. Babies can also get bored easily. They’ll love the extra stimulation and you can take a quick rest, too! 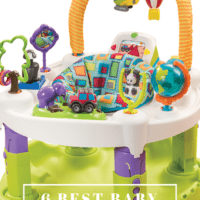 We put together a list of the best baby exersaucers of 2018. You’ll find models that can spin, bounce, travel to the relatives and one that doesn’t even need batteries! What Age Can They Be Used? The Best Exersaucer Money Can Buy? The Best Exersaucer of 2018? A “Green Baby Saucer” For Girls! 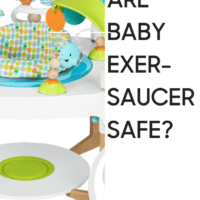 When I first heard the term “Exersaucer”, I thought of NASA and spaceships 🙂 Seriously though, an exersaucer doesn’t fly, but is a baby activity station that has a stable, circular base. They’re also often called “jumpers”. Unlike baby walkers, infants can’t drag them forward or backward with their feet. This helps keeps things safe yet still fun! A common question parents asked by parents is: “What age can my baby use an exersaucer?” The answer is it will depend on your little one’s height and the type you choose, rather than age alone. Usually, the manufacturers recommend when your baby’s feet can touch the ground, that’s when they’ve hit “exersaucer age”. This is often around 6 months. 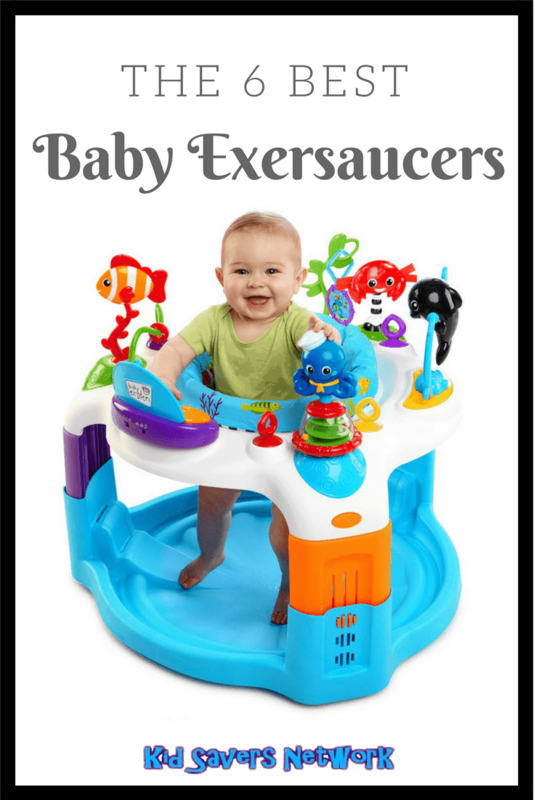 You can expect it to be used until they are 18 months or older before they outgrow the ideal exersaucer age. Exersaucers (also known as “Activity Centers” ) have proven to be much safer than baby walkers over the last few decades. However, some pediatricians believe they cause poor posture and balance control. If you use them too much, they’ll miss out on beneficial things like tummy time and human interaction. It’s important to use them sparingly. For things like trips to the bathrooms and showers, they’re ideal! As you can tell on the typical baby exersaucer, some of the biggest benefits are mental stimulation and development. Closely followed by hand-eye coordination. Overall, it really reinforces developing the baby’s motor skills and strength. On the surface, a baby jumper and an exersaucer look identical. And there is alot of overlap between the product types. But in general, and I mean very general, a baby jumper can be thought of as a device that has more jump capabilites for the baby with fewer toys and activities. 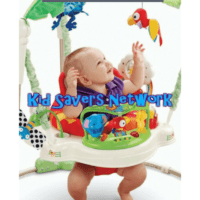 Whereas a baby exersaucer will allow the baby to do some jumping and bouncing, it’s main focus is toys and activities. Well, the Oribel Portoplay has solved these three problems and added some really great features. It’s an activity center, a bouncer and a play table all in one! Which is just as well as it is priced 2 / 3 times more than others on our list. Let’s see if it’s worth the extra money. The Portaplay converts to a play table so your baby can use it up to five years of age. This makes it perfect for toy cars, coloring books and writing practice. It also gets them out from under your feet, too. Being able to use it until age 5 really sets this design apart. You’ll only really get a year – 18 months use out tops from many similar designs. Once my toddler could run about (about a week after he took his first steps) the baby saucer was left forgotten in the corner. In true toddler fashion, he only took an interest again once his younger sister started using it! The Portoplay has three adjustable levels so at 6 months their feet will be near the ground. You can move the seat up to adapt with your growing baby. This will help keep your infant in a comfortable position. It also means they won’t outgrow it too quickly! This Oribel baby activity center is one of the few I’ve seen that is actually foldable. The legs collapse and it’s just 8” to the tallest toy, or 4” if you remove the toys. This makes it easy to stash under the bed, in closets or store flat against the wall. It’s also easy to get in the trunk and take with you when visiting the Grandparents. A great innovation which lets you catch up and keeps your little one happy and entertained (which looks great in the eyes of the mother-in-law). The Portaplay comes with 5 fun and engaging toys which are targeted to different developmental stages. This helps develop different key gross and fine motor skills. The toys are detachable so you can mix and max them to stop your child from getting bored. A feature the best baby activity centers share is that they’re all easy to clean. Not only does this keep things hygienic for your child, but it also helps when it comes to selling or passing it on. It also saves you a lot of time and hassle, too! The surface of the Portaplay’s table, the toys and the fabric seat are easy to wipe-down. The seat is actually machine washable so it’s very easy to clean. The main drawback with this activity center is the price. I think you really need to balance it out with the extended use. It’s well made, travels and stores easily so I’d expect it to cost more. The other drawback with the Portaplay itself is there isn’t a storage bag. When your baby isn’t using the toys they have to come out and are easy to lose. It’s recommended to get a cheap bag for storing these so everything is kept together. In conclusion, the Oribel Portaplay has many more features than it’s competitors. Its design will make it last much longer, too. 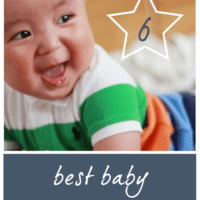 Based on our baby exersaucer reviews, we feel this is one of the best, if not the best, exersaucer for baby. If the price in your budget it could well be the best exersaucer for 2018 based on our exersaucer reviews. Bouncing Seat – The seat bounces 2 – 3” for more fun! Evenflo fairly dominates the exersaucer market. 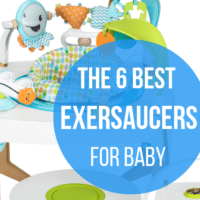 We try to keep this exersaucer reviews as impartial as possible and feature different manufacturers, but they still take up 3/6 positions on our list! This is a reason for that. Not only are they are trusted name in the baby product space, but they also have products for with different budgets and at different price points. Take the Evenflo Bounce And Learn. This is a model with all the bells, whistles and flashing lights. The main selling point is that baby can bounce from a solid, stationary base and strengthen their legs. The “Jam Session” model has lots of toys which are removable. This is great as you can swap in their current favorites and use it in the car / strollers. There are three activity stations with lights and interactive activities – but they need 12 AAA batteries so be warned! Another big plus for the Bounce & Learn is that it can spin 360-degrees. This means your little one can have access to all of the toys and also look around the room too. As with most Evenflo Exersaucers, it is also pretty easy to clean. The seat cover is machine-washable and all the plastic parts wipe down with a damp cloth or the “do it all” baby wipes! You can use the “Jump & Learn” from around 5 months to walking (so anywhere from 1 year – 18 months on average). As it is stationary, there’s a good chance baby will lose interest after this age. 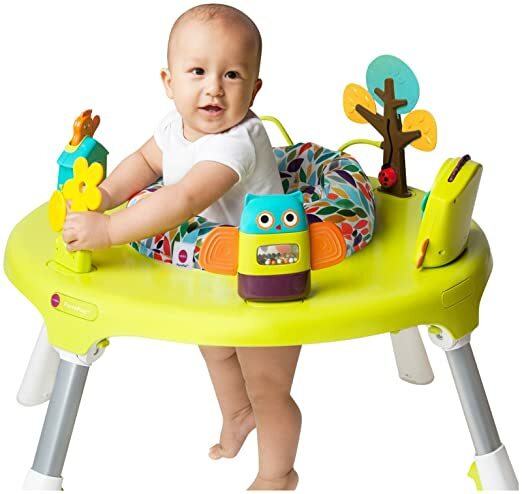 There are 3 adjustable heights to help your little one keep their feet on the ground and start bouncing! Some parents have been using it from 4 months with a pillow at the back. As always, it depends on your own individual baby and how their development is going. No two are the same! You should be aware of a number of downsides to the “Jump and Learn”. We’ve mentioned the batteries and 12 is a lot! If this is a deal-breaker check out the “Sweet Tea Party” design instead. It’s also got a super-wide base which won’t fit through doorways. Meaning the room you assemble it in (and assembly takes around 45 minutes btw) is the room it’ll have to stay. So this is definitely not a travel exersaucer like the “Life in the Amazon”. And it also takes up a fair amount of room, so if space is at a premium this probably isn’t for you. Having said all that, if you’re after a baby saucer that bounces, spins and has a wide variety of toys to stop baby becoming bored, then like many parents and babies – you’ll love it! You can find the Evenflo Jump and Learn on Amazon. Before I had children, I knew we would go through diapers and baby wipes like nothing. I didn’t expect that we’d also be constantly buying some many batteries to power toys as well! Not only is this expensive, but it’s bad for the environment as well. There is a really good Evenflo exersaucer, but I’m shocked that it takes 12 AAA batteries. The battery time is only stated as 2.25 hours as well so you’ll quickly burn through them. Sure, you can turn them off but the flashing lights and gizmos are the reason why it’s so expensive. Which brings me nicely on to Evenflo’s “Bounce & Learn Sweet Tea Party”. It requires absolutely no batteries and is a fraction of the cost. You might think that less cost would result in fewer features, and you might be right. There is no music or flashing lights. But this model still has all the good things you’d expect with an Evenflo exersaucer. It can spin so your child can access all of the toys and look around. It also rocks and bounces (but not overly) to help strengthen leg muscles and keep things fun. The tea party theme is also very cute. There are cakes to stack, flowers to rattle and mirrors to giggle at. You can also move the arm to bring the toys closer to your little one to which is great. The ribbons on the teethers are not overly long so there is no choking hazard either. The saucer base itself is very stable. There are 4 small feet which make contact with the ground and they won’t scratch your floor when you move it. And at 14.5 lbs, it’s almost half-as-light as some of the more bulkier designs. I think some manufacturers forget how often us poor moms have to lift and carry these products! Like others on our list, there are three adjustable heights to this model. Some parents begin to use it from around 3 months old, by stuffing a blanket at the back. I think you should really wait until your baby has good head and neck control before using it, though! Many parents report that the installation is quick and easy. All of Evenflo’s products come with simple-to-follow instructions. You should expect to have this up and ready in around 15 minutes. The seat cover is also machine washable and everything wipes down nice and easily too. To recap the obvious drawback, there are no flashing lights and music. There are not 60 toys like other baby saucers either. However, at the low price that this is available for online (and the savings you’ll make on batteries alone) it’s easily the best value exersaucer on the market today. If your little one is a fan of the ocean, this sea-themed Baby Einstein exersaucer is the perfect toy for them. 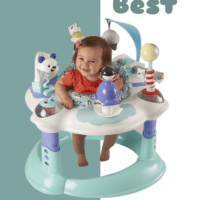 The Reef Activity Saucer comes with more than 12 activities, including an electronic piano. It also has a language discoverer and 3 different modes of play. Your baby can play classic melodies or they can hear fun ocean sounds. The variety of toys seems endless and it doesn’t stop there. There are link loops that allow you to add more toys to keep things fresh and engaging. The seat can also rotate 360 degrees to give your baby full access to all the toys. There are 3 height positions for your growing child. The seat pad is also very easy to clean. Just remove it and wipe it down. The Reef Activity Saucer is multi-lingual with English, Spanish and French settings. Kids are never too young to work on a second (or third!) language. In fact, research show it’s the best time! Some parents have complained the piano keys are hard and have a bit of a static sound. Always ensure everything has been installed correctly to avoid such issues. We especially like this Baby Einstein Activity Saucer because it not only keeps babies entertained, but the electric piano will nurture their musical talents too! You can check today’s price here. This Evenflo exersaucer is great for kids who love animals. With Toucan birds, monkeys and chameleons, it really does resemble the Amazon forest. There are also 11 fun activities for your little one to enjoy and it bounces as well! 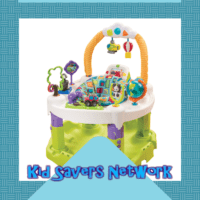 Each of the activities and toys focuses on your child’s developmental milestones. These include fine motor skills, object exploration, tactile development and even more. The Evenflo “Life in the Amazon” can also grow with your child, too. It transforms from an activity mat to an activity center and finally into a table. This means you can use it from newborn to preschool age. When your little one is able to pull themselves up to walk, this model can be converted into a table. This helps encourage standing in your soon-to-be toddler. It also folds down and has a handle, making it easier to transport or store. A drawback with this particular baby saucer is it can be pretty difficult to assemble. You may need some time with your spouse reading directions and putting pieces together. Another complaint has been that children can remove the birds too easily. At a certain age, babies just love grabbing hold of things and throwing them to the ground! If you are looking for a travel exersaucer that can grow with your baby, Evenflo’s exersaucer triple fun “Life in the Amazon” fits the bill. Fittingly, it’s available on Amazon, too! You can check the latest price here. The Bright Starts Comfort and Harmony Activity station is a uniquely designed baby activity center. There are more than 15 toys, activities, and sounds to keep your baby entertained. Most baby saucers have your child sit in the center. The Bright Starts activity center seats them so they can shuffle around a fixed table. This allows your little one to go back and forth and reach all the activities. It’s designed this way to promote walking and avoid postural problems. It also stops your infant from becoming frustrated by things that are out of reach! This activity center also comes with lots of sounds, too. There’s a piano station with three modes of play: melodies, animal sounds, and regular piano sounds. It has a flip book that activates melodies and silly sounds that your baby will love. The Bright Starts Activity center can also be converted into a walker or an activity table. It’s great for babies who are just learning how to walk. Once they are almost ready, simply remove the seat and let them use the table as support. One drawback to his particular design is the seat is not adjustable. Due to its unique design, it takes up quite a bit of floor space, too. We like this Bright Starts activity center because it has more toys than others on the list and it also has a piano. The “3 in 1” features mean it will l last longer than just a few months. I put a lot of stock in a safe and stable design, too. it’s an overall solid exersaucer for baby. You can check the latest price here.